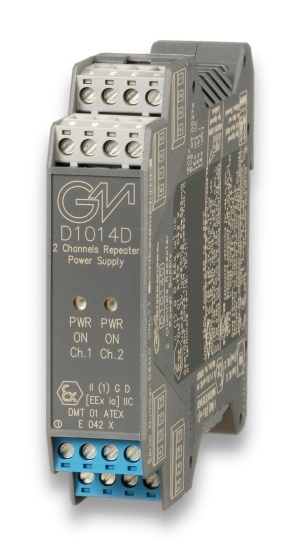 The dual channel DIN-Rail Repeater Power Supply,D1014D, is a high integrity analog input interface suitable for applications requiring SIL 2 level (according to IEC61508:2010) in safety related system for high risk industries. Provides a fully floating dc supply for energizing conventional 2 wires 4-20 mA transmitters located in Hazardous Area, and repeats the current in floating circuit to drive a Safe Area load. The circuit allows bi-directional communication signals, for Hart transmitters.